This spring I’ve spent hours and hours and hours taking pictures of fleabanes and reading about fleabanes and studying fleabanes, all with the intent of writing a detailed post with tips for field identification. It didn’t seem like I was making any progress… until I started writing this post anyway. The act of attempting to explain something forces me to think about it clearly and organize the details, and with that comes deeper understanding. Also with that came the realization that I have no pictures of Robin’s plantain, and it’s done blooming for the year probably, so gah! Maybe next year. 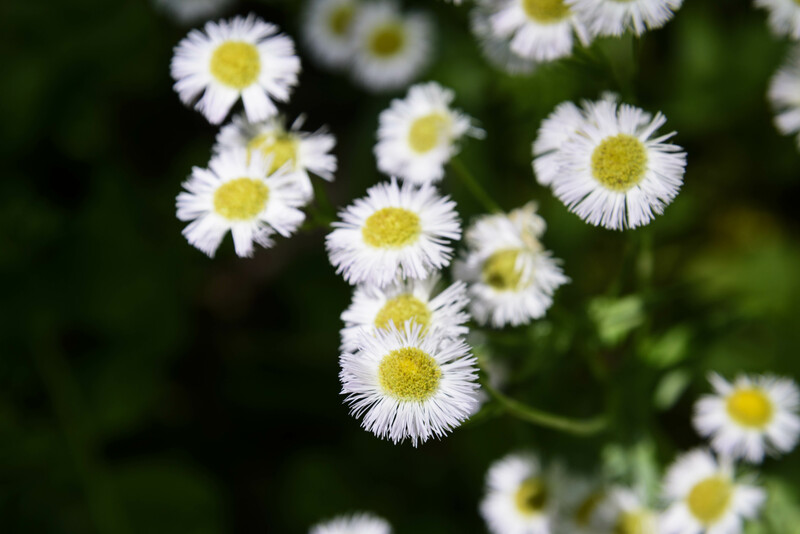 Erigeron flowers look like daisies, but with many more rays. Four species of them are found in the Maryland Piedmont. Here’s a brief summary of their characteristics. Usually the tallest of the fleabanes, though height is variable. The literature says this one grows to three and a half feet tall, but I’ve seen them much taller than that. 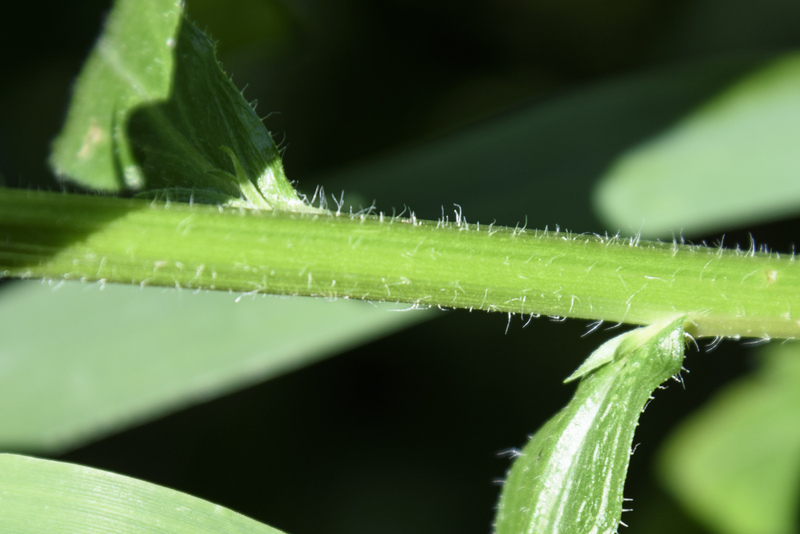 The stem is generally sparsely hairy, and the hairs are generally spreading (but descriptions vary a lot). The stem may branch near the top; overall the plant may produce as many as 50 flower heads. 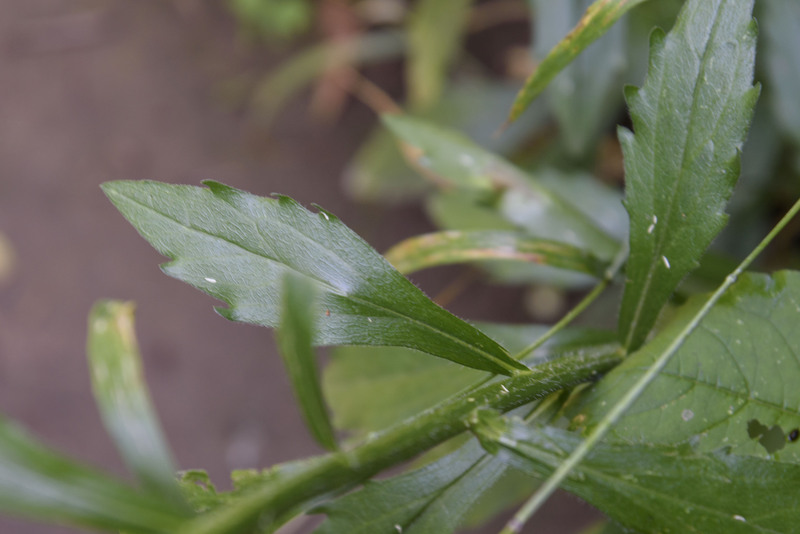 The basal rosette of leaves usually withers by the time the plant flowers. The stem bears many leaves along its entire length. The lower ones are large, toothed, and have petioles, while the upper ones are a little if at all smaller, slightly toothed or maybe entire, and sessile. The leaves are lanceolate to oblong. The flowers have anywhere from 50 to 120 rays; flower buds are conspicuously hairy. They bloom from summer into fall, on and off, and like disturbed, weedy areas. 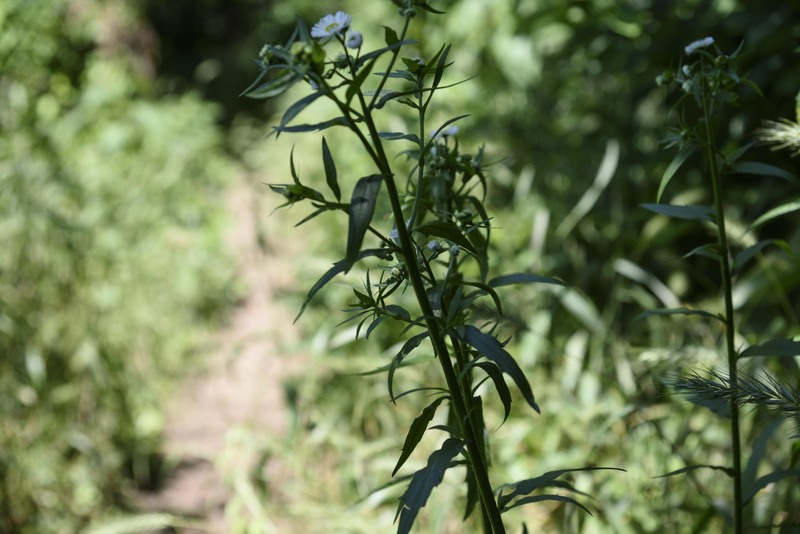 This one can reach two and a half feet in height, with sparsely hairy stems that may branch near the top. The oblanceolate-to-obovate basal leaves may be present during flowering, or may have withered. 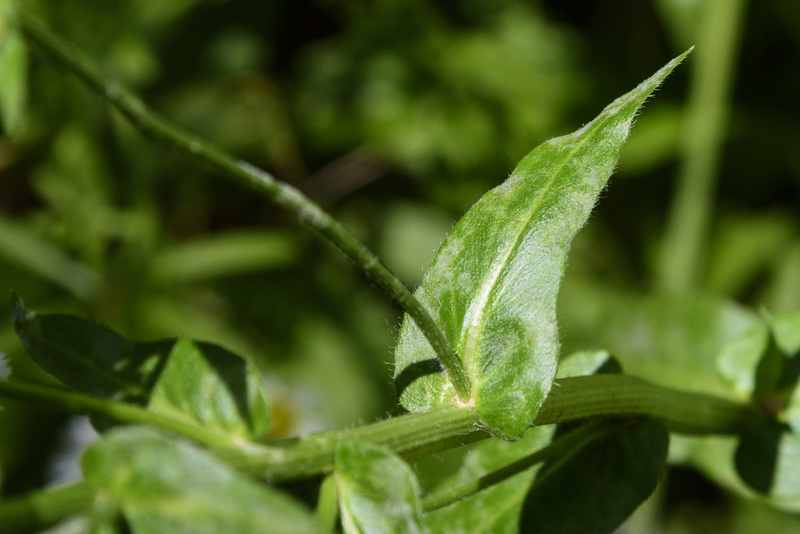 The stem leaves are variously shaped, from ovate to narrowly elliptic, but they get smaller in size and fewer in number as they ascend the stem. 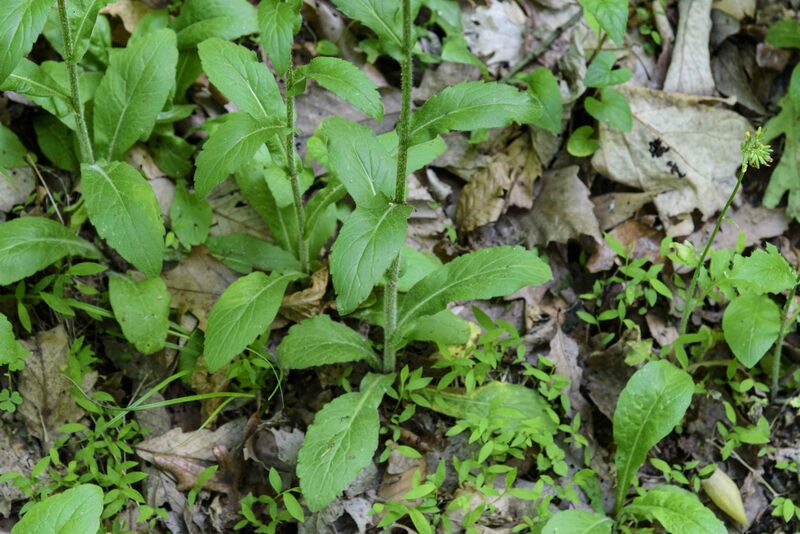 Lower stem leaves may have a few teeth, while upper ones are entire; all leaves may be pubescent to some extent. There are single leafy bracts near the inflorescences. The plants bear from one to 35 flower heads, each with anywhere from 150 to 400 rays, from late spring to mid summer. 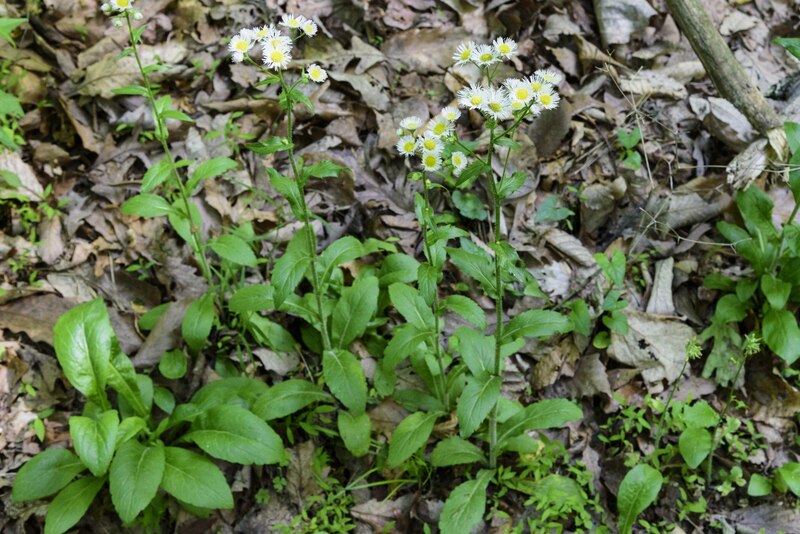 The plants like moist, disturbed areas (think roadside depressions). 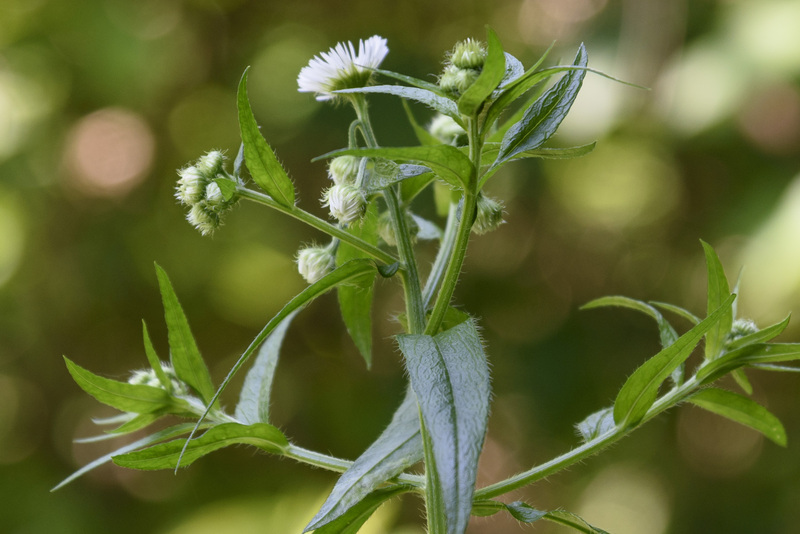 Usually the shortest of the fleabanes, to two feet tall, unbranched and bearing one to nine flower heads, and often described as having a “stout” appearance. The stem is conspicuously hairy along its entire length. The basal rosette of spatulate (spoon-shaped) leaves is present during flowering. The few stems leaves are dentate, somewhat hairy, oblong, and clasping. The flowers are generally the largest of these four fleabanes, up to an inch and a half across, and have 50 to 100 rays. They bloom from mid-spring to early summer, and prefer rocky, less disturbed areas. I deeply regret that I have no photos of this plant. 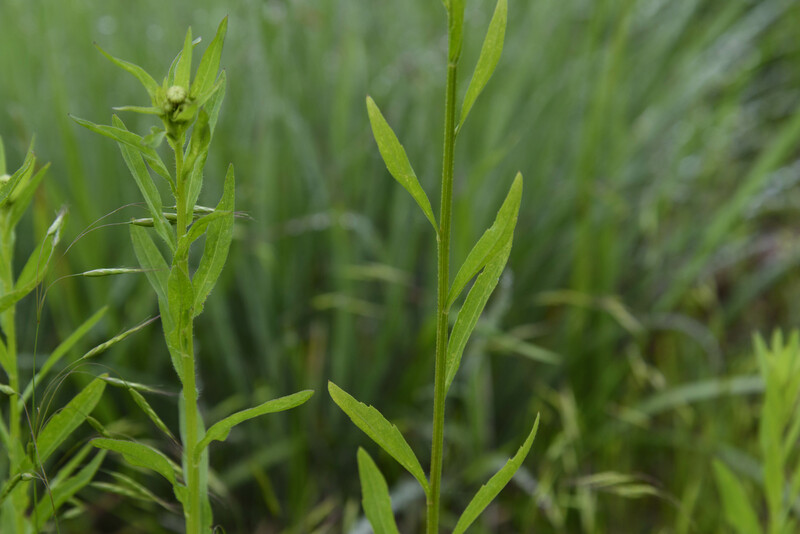 Having learned how to identify the fleabanes, I went back through all my photos; every one that I had thought might be Robin’s plantain has ended up being common fleabane. There are some very nice, clear pictures on this blog. 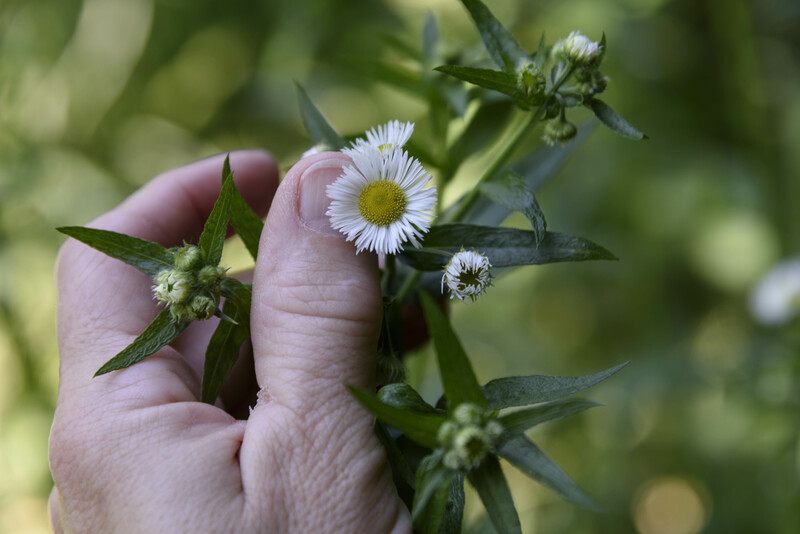 This not-commonly-seen fleabane can reach three feet in height, with a stem that may branch near the top. The stem hairiness is described differently by various authorities, but the specific epithet strigosus is taken from the word strigose, which refers to hairs which are short and lie close to the stem, pointing upwards. This is one identifying characteristic of the species. 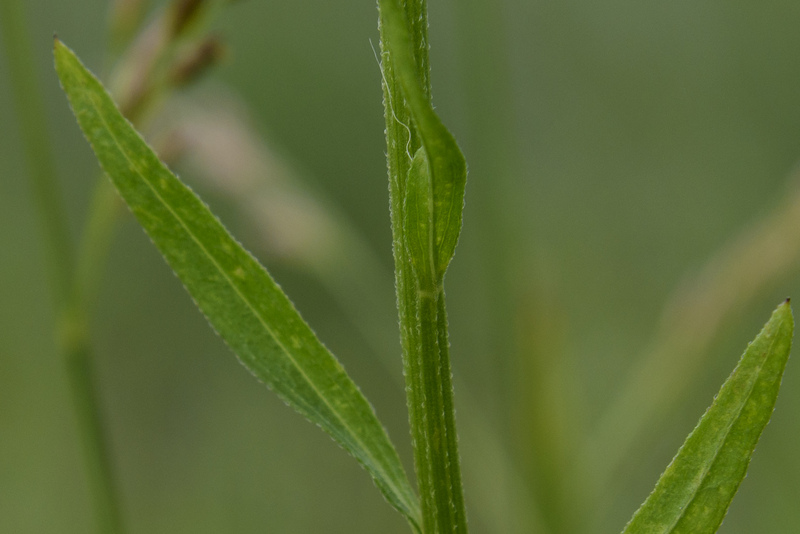 Another is the stem leaves, which are much closer to linear than any of the other species’ leaves. There aren’t many of them. The larger/lower ones may have a few coarse teeth or be crenate, and have long, sometimes winged petioles, while the upper leaves are more likely to be entire and sessile or with short petioles. The basal leaves are usually present during flowering. Each plant can bear 10 to 200 flower heads, each flower with 40 to 100 rays. This species blooms at about the same time as E. philadelphicus (late spring to mid summer), but prefers higher quality habitats. Individual plants vary, and each of these species except the annual has 3 or 4 varieties, each with differing characteristics. Identification is not always straightforward. About color: all these species have white flowers, but some can have a pinkish or bluish tint to them. In many species color is an unreliable characteristic, and in these species it should not be considered diagnostic. 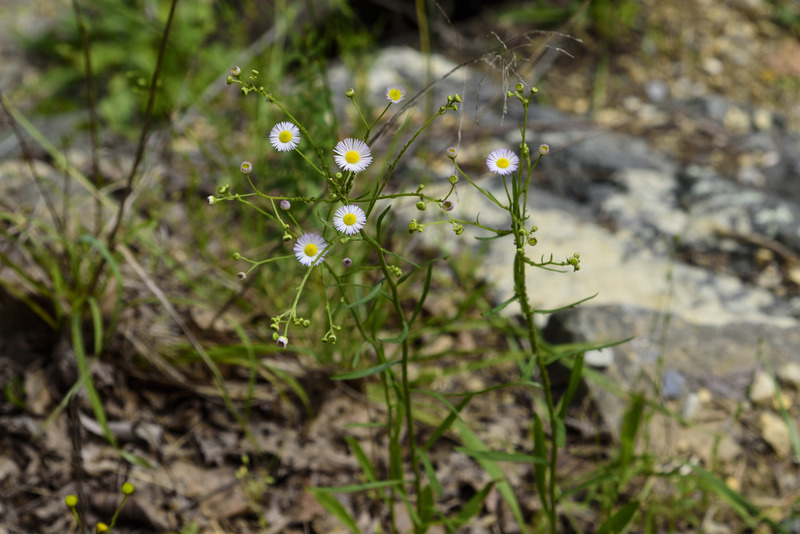 There are close to two hundred species of Erigeron in North America, almost all of which are native. E. annuus, E. philadelphicus, and E. strigosus are found in almost every state and province, while E. pulchellus is found on the eastern half of the continent. 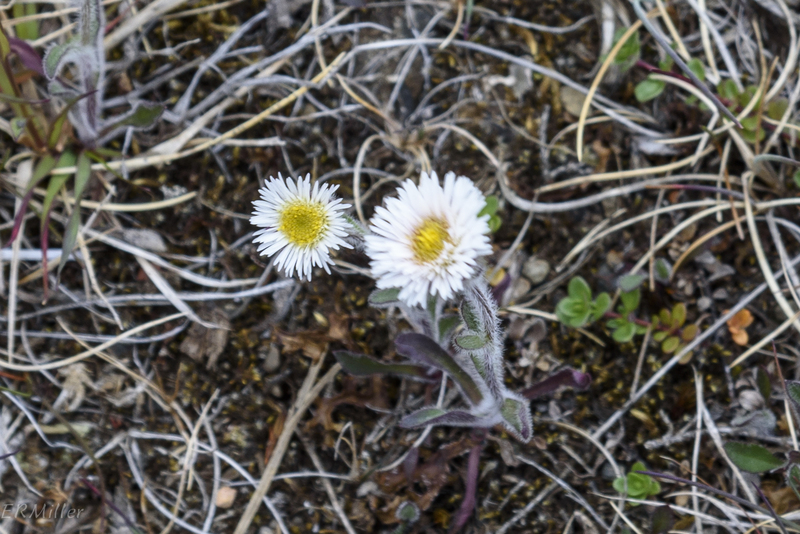 Just for fun, here’s E. uniflorus, oneflower fleabane, spotted in Iceland last summer. It’s also found in Alaska, Canada, and Greenland. 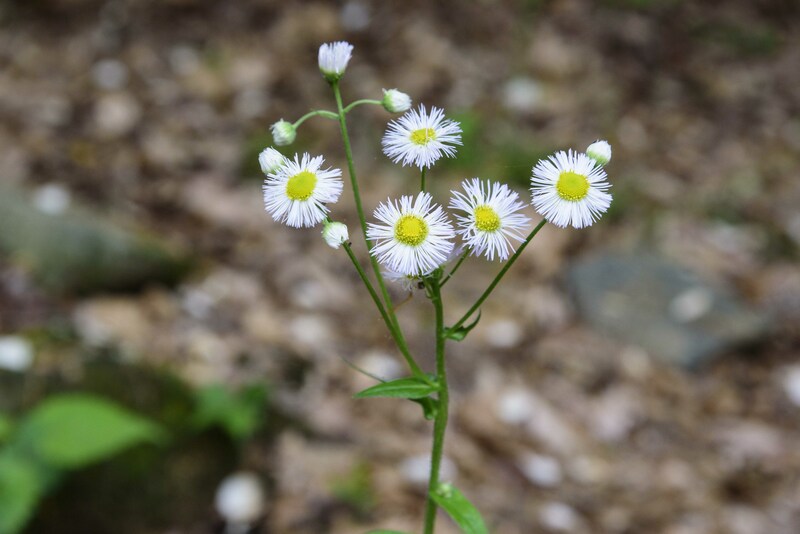 This entry was posted in Uncategorized and tagged Asteraceae, Erigeron, fleabanes by elizabeth. Bookmark the permalink.